My name is Gudipati Subba Rao aged 75 resident of Hyderabad Telangana India with my wife 70 years urge for your kindness to help us , the unfortunate, and the most desperate parents of our beloved daughter Smt. 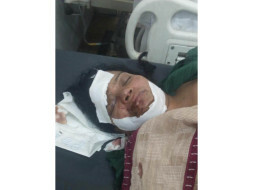 LAKSHMI PREETI who is hospitalized with multiple fractures and is in unconscious state after a serious accident ( YouTube link of TV news: https://m.youtube.com/watch?v=DNbbjR1O9qE ) where she even lost her husband. Preeti has been a very hardworking woman who used to work for a minimum of 15-16 hrs a day, to raise her family of husband and two kids . 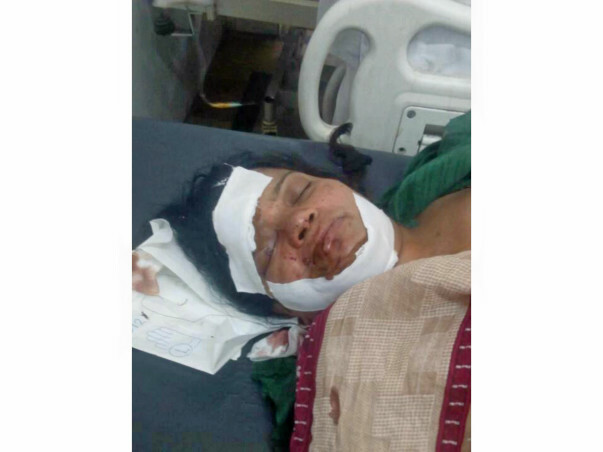 They met with a tragic accident while going to TIRUPATI in a private Car (Registration No. AP 09 CM 1916 ) for BALAJI Darshan. A Container Lorry (Regn.No. TN 11 V 1923), coming from opposite side, directly collided with the said Car at the early hours on 30th May 2017, near Anjaneyaswamy temple of Anantarajupeta village, of Rly Kodur Mandal, Kadapa Dist (AP). My son-in-law Shri SHYAM SUNDER RAO, and his friend Shri VUSAA SRINIVAS RAO died on the spot. Rly Kodur Police rushed my daughter Smt. R.LAKSHMI PREETI, to a hospital in TIRUPATI , in 108 Ambulance services, for emergency treatment. 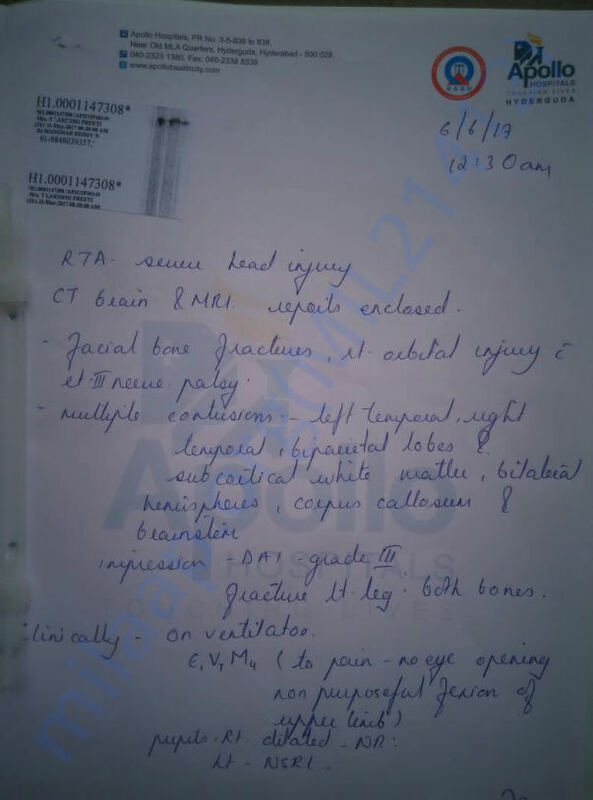 On reaching the Ruya Hospital, the doctors extended emergency treatment to my daughter (Smt LAKSHMI PREETI), who was in coma and with multiple major fractures, and grievous internal injuries. ( the local news paper clipping is attached) . 2. 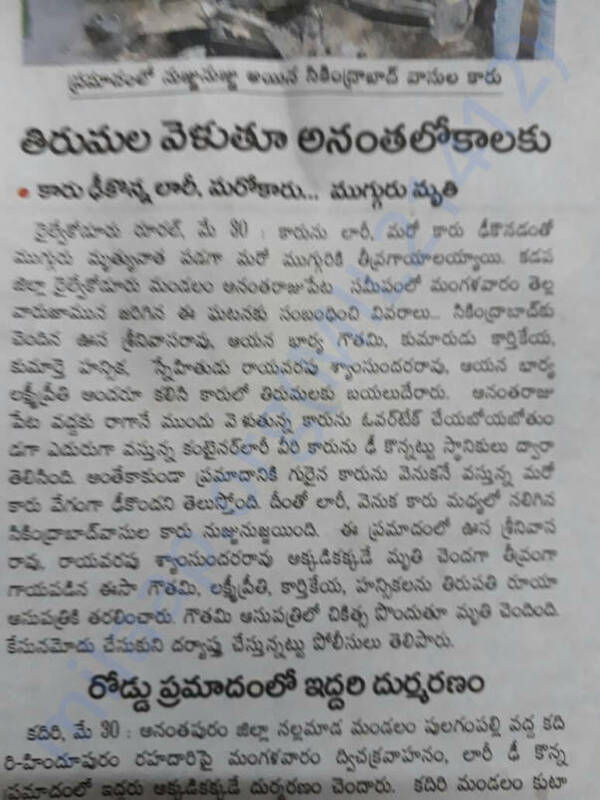 We brought our daughter Smt.LAKSHMI PREETI to Hyderabad, place of our residence, in a complete unconscious (coma) state for further treatment , and admitted her into `APOLLO Hosp.’ (Hyderguda – Hyderabad), where, she was treated for a week, for which, we were charged about Rs.5.5 lakhs (Rs.550000 about $ 9,000). My retirement savings and family funds have been exhausted. Unable to bear further expenses, we requested her move to NIMS, (Nizam Institute of Medical Sciences), Hyderabad, which is partially owned by the Government, for continuation of treatment. After about 10 days of stay at NIMS, the Hospital authorities have advised us to shift our daughter to any Rehabilitation Centre, where she could get an appropriate long term treatment. And thus, we moved our daughter to a rehab named ` SUVITAS HOLISTIC HEALTH CARE, Pvt. Ltd., located at SRINAGAR COLONY (Plot No.58), near RATNADEEP Super Market, Hyd -73 on 14th June 2017. Since then, she is being treated there and the entire hospital charges (medicines, and other day to day requirement to manage the Patient) till today, are being borne solely by very kind hearts from `Parents association’ of Delhi Public School Gachibouli Branch, (Hyderabad). Without their timely help it would have been close to impossible for us to sustain such a financial burden with our very limited financial resources. Currently, we notice some improvement in her state where Preeti is responding to sounds and movements via fingers and eyes. This gives us hope to continue her treatment. However, being in such a mental agony that this accident caused to us in this old age we are also dealing the financial constraints. We are dependent only on meager Army pension and, having no other source of income of any kind, we are emotionally and financial very stretched. It is now, over three months have passed since accident and my daughter continues to be lying helplessly on hospital bed and we are hoping that the treatment would definitely bring her back to her grieving children. 4. In these circumstances, may I request you, to kindly extend helping hand to me, an aged father who is totally traumatized and in unexplainable distress especially to continue the required treatment to my unfortunate daughter, who also has not only lost her husband but is stuck In unexplainable pain, please? Any financial help is greatly appreciated. The local newspaper cutting with details are attached. Thank you so much for your help and God bless you ! Here is an update on Lakshmi Preeti. She got discharged from the Rehab Center on 1st December. Currently, she is at home, she is undergoing home-nursing, she is on regular medication and physiotherapy. She has to go for her check-ups once in two weeks. Doctors are saying it can take 6 months to 1 year for full recovery. Thank you for your love and support. Please pray for her health and speedy recovery. Lakshmi Preeti is now recovering. Right now physiotherapy and walking practice is going on , which at this point she is finding it difficult but slowly trying to improve. Here is an update on SMT. LAKSHMI PREETI, THE BENEFICIARY, FROM YOU ALL BENEVOLENT DONORS. The miracle is being witnessed in case of my daughter LAKSHMI PREETI, who originally slipped into a coma in a car accident on 30th May 2017. After 3 months in the coma, miraculously for the last 20-25 days, she has shown good progress by coming back to senses, with a reasonable state of memory, by recognizing people, and also attempting to do small talk of relevance. This is totally acclaimed or attributed to the sincere prayers from the depth of the hearts, heartfelt wishes, and blessings of people like you. There is no denying the fact, which even Doctors attending on her accept. Because of you all, I could get good financial help and with your prayers she is definitely out of life-threatening situation, with a day to day gradual progress. Of course, some major fractures, and damage to the right eye is painful for Preeti and all of us. The fact is, with the invaluable help from you all Donors, with humanity, I could continue to carry out appropriate medical treatment at desired Hospital(s), as situation demanding, consequently, my daughter came out of coma recognizing people, and is able to converse with people calling on her slowly. A few days back we have taken her to NIMS (Nizam Institute of Medical Sciences), and on the advice of concerned Orthopaedic doctor, specially made supporting pad to the measure of her left leg from below knee is specially made, and fixed. Physiotherapist, besides making her to do usual exercises, also is trying to make her stand, and put to walk slowly. Dentist, who was called on her at the Rehab Centre, carried out some preliminary checkups. Now, we have to take her to Ophthalmologist for (Rt.) eye check up, and to `Ortho’ for further advice, besides taking her to Dental Hosp for proper, and thorough check up with relevant equipment, in course of time. Everything presently is moving in right direction, and towards desired progress. THUS, MY DAUGHTER COULD BE ABLE TO TAKE `REBIRTH’. AND THIS IS ALL DUE TO YOUR TIMELY FINANCIAL HELP, HEARTY PRAYERS/WISHES, AND SINCERE BLESSINGS, FOR WHICH GENEROSITY, AND HUMANITY, AND BENEVOLENCE, I AND MY FAMILY, SHALL REMAIN EVER GRATEFUL TO YOU ALL.